A menu bar at the top for file import and export and various preferences. The middle part is made up of two section or tab views. 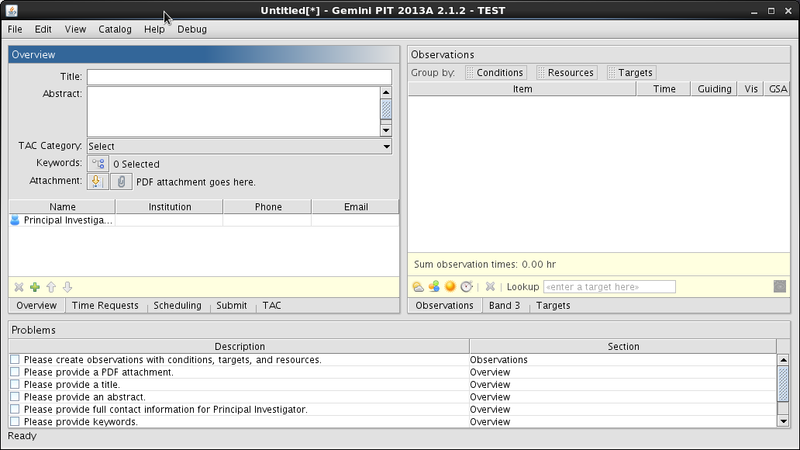 The different sections, "Overview, Time Requests, Scheduling, and Submit" on the left and "Observations, Band 3, and Targets" on the right, are selected using the tab buttons along the bottom of each section window. At the bottom is a "Problems" section (which can be seen as a "To Do list"). The main window can be resized by clicking and dragging the lower right corner. The individual section panes can also be resized by hovering the mouse cursor between the panes until the cursor becomes two oppositely-pointing arrows, and then dragging the pane in the direction of the arrows. There is no specific order required to fill the different sections. Yet, you can find below a series of videos and documentation that suggest a proper way to prepare a Gemini proposal using PIT. NOTE that links in the text below lead to separate pages with details on the different sections and elements. Also, all the videos can be viewed from a single playlist. Additional information can be found about the PDF Attachment. Please fin also details about the Menu Bar (at the top of PIT), and the Problems section (at the bottom of PIT). Video tutorial: How to use the Overview section, the menu bar and the Problems section (or read about the section). The target list is prepared separately in the Targets section. The Time Allocations Committees will first see if your proposal can be given a Band 1 or a Band 2 program. If the result comes negative, your program may be considered for Band 3. If your project contains observations that can be taken under relaxed weather conditions (e.g., IQ85% and/or CC85%), that have a R.A. coordinates that are not the most popular and you have no constraints on the scheduling, you can prepare them under the Band 3 section. The Scheduling and the Time Requests sections are accessible through tabs visible uner the same pane where the Overview section is. The Scheduling section is used to communicate any releavant information to the Time Allocation Committees about the timing constraints for your targets. It can be specific times when an event is expected, useful information about a non-siderial target, constraints on a classical observer availability, etc. The Time Requests section is used to determine which TAC(s) to send the proposal to, and how much time to each TAC is requested. The Submit section tells if a proposal is ready to submit. If it is not, please refer to the Problem section to see what reamins to be fixed. Once everything is in order, the "Submit this Proposal" becomes available.